Verse meets visuals in motion at Northwest Film Forum (NWFF) in April 2019. 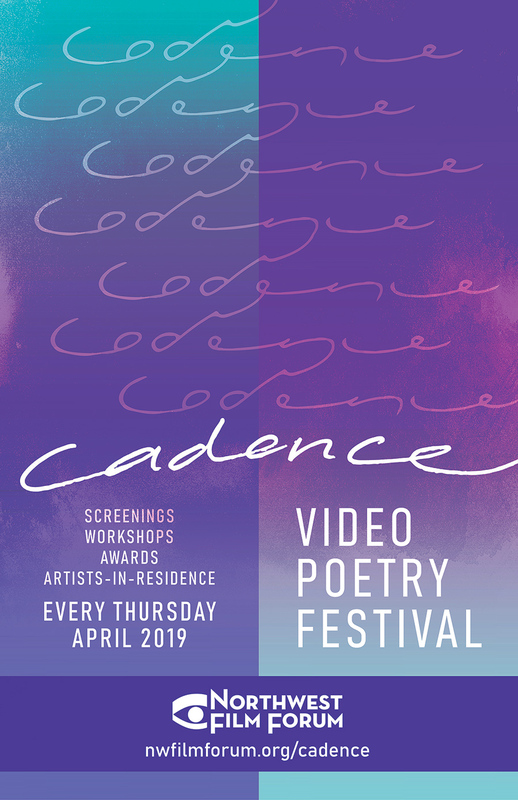 Cadence: Video Poetry Festival, presented by Northwest Film Forum, programmed in collaboration with Seattle author Chelsea Werner-Jatzke, is a series of screenings, workshops, and discussions on the genre of video poetry, throughout National Poetry Month. Entering its second year, Cadence is growing considerably to fill a gap in the presentation of video poetry in the Pacific Northwest. Featuring four screenings, one each Thursday of the month, the festival’s inaugural Artist-in-Residence, generative workshops for youth and adults, and a juried selection of open submissions, Cadence fosters critical and creative growth around the oft overlooked medium of video poetry. Cadence approaches video poetry as a literary genre presented as visual media that makes new meaning from the combination of text and moving image. Cadence Artist in Residence Catherine Bresner’s work will be on view in the Video Art Gallery in NWFF’s lobby throughout the month. An exquisite corpse poem generated during the 2018 Airstream Poetry Festival will be translated into video by artist Shaun Kardinal and shared over Instagram stories throughout the month. April 6 – 11:00am-5:00pm: The Image Speaks video poetry workshop for adults ages 16+, led by Amaranth Borsuk. April 13 – 11:00am – 4:00pm: Making Video Poetry workshop for youth ages 13-18, led by Catherine Bresner. April 25 – 7:00pm: Video poetry outcomes from the generative workshops will be screened alongside the winning submissions. Thursdays in April, video poetry alights on screen! Showcase curated by local publishers and arts organization partners Interbay Cinema Society, Jack Straw Cultural Center, Mount Analogue, Poetry Northwest, Pongo Publishing, and Seattle City of Literature. Selection of video poetry from the Cadence open call for entries in four categories: Adaptations/Ekphrasis, Collaboration, Video by Poets, and Poetry by Video Artists. Judges within each of these categories will select a winning work that will be featured again at the closing screening. Showcase of the new video poetry generated by the festival’s many programs! The screening features the outcomes of both the youth and adult video poetry workshops, the work created by Catherine Bresner during her residency at NWFF, the award-winning films from the open call for submissions, and a video poetry discussion featuring the local Cadence partner organizations. In a supportive workshop environment, we will write, film, and experiment, conceptualizing and developing video poems that may stretch the bounds of the genre. Fun, explorative, and experimental, this workshop will help students understand the many ways poetry can be experienced off the page to collaboratively create a video poem. Poet and collage artist Catherine Bresner is Cadence’s first Artist in Residence. Throughout the month she will have access to NWFF resources including the edit lab and gear use to develop a new video poem. In addition to generating her own work during the residency, Bresner will lead the generative youth workshop on video poetry for 13 to 18 year olds. Examples of her artwork will be available to view in the Video Art Gallery in the Northwest Film Forum lobby throughout the month with her new piece premiering at NWFF on April 25. Catherine Bresner is a poet and visual artist living in Seattle. Her hybrid book of poetry and poetry comics, the empty season, won the Diode Edition Book Prize in 2017. She is also the author of the chapbook The Merriam Webster Series and the artist book Everyday Eros (Mount Analogue 2017). Her poetry has appeared in The Offing, Heavy Feather Review, Gulf Coast, Poetry Northwest, Passages North, Verse Daily and elsewhere. She has been the coordinating editor of the Seattle Review and the publicity assistant for Wave Books. Currently, she is the managing editor for BOAAT Press. Shawn Levy is the former film critic of The Oregonian and KGW-TV. His writing has appeared in Sight and Sound, Film Comment, American Film, The New York Times, The Los Angeles Times, The Guardian, and The Black Rock Beacon. He is the author of nine books, including the upcoming The Castle on Sunset: Life, Death, Art, Love, and Scandal at Hollywood’s Chateau Marmont, and the bestsellers Rat Pack Confidential and Paul Newman: A Life. He jumps and claps and sings for victory in Portland, Oregon. John Bresland works in film, radio and print. His work has been installed at the Pulitzer Arts Foundation, collected in Essayists on the Essay: Montaigne to Our Time as well as The Fourth Genre, an anthology of contemporary creative nonfiction. His most recent video work, “Touch,” coauthored with James J. Hodge and C.A. Davis, was selected by Sight & Sound magazine as one of the best video essays of 2018. He teaches creative writing and media arts at Northwestern University. Sarah Minor is a writer and visual artist and the video editor at TriQuarterly Review. Her visual essays appear recently in places like Ninth Letter, Mid-American Review and Diagram, and were selected for the 2019 Barthelme Prize in Short Prose. She teaches as Assistant Professor of Creative Writing at the Cleveland Institute of Art. Claudia Castro Luna is Washington State Poet Laureate. She served as Seattle’s Civic Poet, from 2015-2017 and is the author of the Pushcart nominated and Killing Marías (Two Sylvias Press) also shortlisted for WA State 2018 Book Award in poetry and This City, (Floating Bridge Press). She is also the creator of the acclaimed Seattle Poetic Grid. Castro Luna is a Hedgebrook and VONA alumna, a 2014 Jack Straw fellow, the recipient of individual artist grants from King County 4Culture and Seattle’s Office of Arts and Culture. NWFF’s call for video poetry submissions is now closed. Thank you to all who submitted! Adaptations/Ekphrasis: Videos created to bring new meaning and dimension to pre-existing poetry. Any poems used for this purpose must be in the public domain or else used with written consent of the author. Collaboration: Video poems created in collaboration between a videographer or video artist and poet. Video by Poets: Poets creating video from, or as, their writing. Poetry by Video Artists: Video artists using text visually or through audio intrinsic to the poetic meaning. Please direct questions regarding 2020 submissions to NWFF Artistic Director Rana San at rana@nwfilmforum.org. Cadence Video Poetry Festival proudly accepts entries via FilmFreeway. Chelsea Werner-Jatzke is the author of Adventures in Property Management (Sibling Rivalry, 2017) and Thunder Lizard (H_NGM_N, 2016). She is co-founder and director of Till, a literary organization that offers an annual writing residency at Smoke Farm in Arlington, WA. She is outreach coordinator for Conium Review and was previously managing fiction editor at Pacifica Literary Review. She has received support from Jack Straw Cultural Center as a writing fellow, from Artist Trust as an EDGE participant, and from the Cornish College Arts Incubator. She’s received writing residencies from Vermont Studio Center and Ragdale Foundation. Werner-Jatzke has taught creative writing through Seattle Central Community College and served on the board of Lit Crawl Seattle. She received her MFA from Goddard College, during which she was editor-in-chief of Pitkin Review and founded Lit.mustest, a now-defunct reading series. Thank you to The Evergrey for their support of Cadence: Video Poetry Festival as a Media Partner! Thank you to Entre Ríos Books for their support of Cadence: Video Poetry Festival as an Event Sponsor! The Cadence that started it all!